WASHINGTON, Mar 5 2014 (IPS) - In the latest twist in a 21-year-old environmental pollution case, a U.S. federal judge Tuesday ruled that the victims of massive oil spillage and their U.S. attorney could not collect on a nine-billion-dollar judgement by Ecuador’s supreme court against the Chevron Corporation. 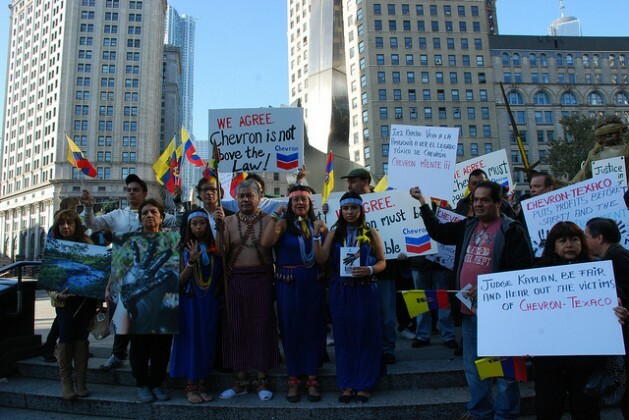 In a racketeering case brought by the U.S. oil giant, the judge found that the lawyer, Steven Donziger, and his associates had used bribery and falsified evidence to prevail against Chevron in Ecuador’s courts and thus should not be permitted to collect damages. “It is distressing that the course of justice was perverted,” the District Court Judge Lewis Kaplan wrote in a nearly 500-page ruling. Chevron applauded the judgement “as a resounding victory,” while Donziger and his attorneys said they would take the ruling to the same appeals court that overturned a similar judgement in the case rendered by Kaplan in 2011. At that time, Chevron appealed to the U.S. Supreme Court to uphold Kaplan’s original ruling, but the Court rejected the appeal without comment. The case was first filed in the U.S. federal court in 1993 on behalf of 30,000 mostly indigenous residents of the Lago Agrio region of the Ecuadorean Amazon where Texaco, which was acquired by Chevron in 2001, had operated continuously from the 1960s until 1992. For much of that period, it worked in partnership with Petroecuador, which took over all of Texaco’s operations in the region when the U.S. oil giant left. The plaintiffs claim that Texaco dumped more than 70 billion litres of toxic liquids, left some 910 waste pits filled with toxic sludge, and flared millions of cubic metres of toxic gases – poisoning the environment in one of the most biologically diverse areas in South America and creating serious health problems, including an unusually high incidence of cancer, for people living in the region. Apparently concerned that U.S. courts would be more sympathetic to the plaintiffs’ case, Texaco persuaded Judge Jed Rakoff to have the case transferred to Ecuador in 2002 — when it was ruled by a conservative government eager for foreign investment — on condition that the company waive certain defences, such as the expiration of the statute of limitations, and ensure that any judgement would be enforceable in the U.S. The Ecuadorean case was filed the following year. Chevron has long argued that the damages cited by the plaintiffs are exaggerated and that, in any case, Texaco extinguished its obligations when it carried out a 40-million- dollar environmental remediation project as part of a 1995 agreement with the Ecuadorean government that covered 37.5 percent of the well sites and waste pits in the concession area. The remaining sites were to be cleaned up by Petroecuador, according to Chevron. But the plaintiffs, who are backed by a number of local and international green groups, have argued that Chevron, having drilled all of the original sites, also remains responsible for Petroecuador’s portion, as well as for the continuing health and other impacts of its operations that are not covered by the 1995 agreement. The trial court in Ecuador ruled against Chevron and granted the plaintiffs, who were represented by Donziger and his associates, an 18 billion dollar judgement. The country’s Supreme Court subsequent upheld the judgement but reduced the damages to 9.5 billion dollars. Chevron, however, has sought to prevent the plaintiffs from collecting any of the money, by, among other steps, withdrawing all of its assets from Ecuador and initiating a racketeering suit against Donziger and his team based on its charges that they used bribery and other corrupt methods to win the case and extort billions of dollars from the company. To sustain those charges, it subpoenaed tens of thousands of documents, emails, and other materials from Donziger and other lawyers, as well as activist groups that supported the case. It even subpoenaed out-takes from a 2009 documentary produced by film-maker Joe Berlinger, “Crude,” about the case. In his testimony last November, Donziger himself admitted making mistakes, such as concealing his interactions with and payments to a court-appointed expert witness who produced a report on which the Ecuadorean courts relied for the assessment of damages. One former Ecuadorean judge testified for Chevron that plaintiffs paid him to ghostwrite opinions for the presiding judge who had been promised half a million dollars by Donziger for a favourable ruling. Both Donziger and the presiding judge, Nicolas Zambrano, vehemently denied those charges. Nonetheless, Kaplan, who has never questioned the extent of the environmental damage wrought by the oil companies’ operations in the region, ruled in favour of Chevron, noting that “an innocent defendant is no more entitled to submit false evidence, to co-opt and pay off a court-appointed expert or to coerce or bribe a judge or jury than a guilty one.” He also noted that Donziger himself stood to win more than 600 million dollars in contingency fees. If upheld, Kaplan’s ruling would prevent Donziger and the plaintiffs from collecting any damages from Chevron in U.S. courts. It also requires them to turn over any damages against Chevron they might collect in foreign courts to the company. The plaintiffs have brought cases in three countries where Chevron has major operations and assets — Canada, Brazil, and Argentina – to enforce the Ecuadorean judgment, and Chevron’s CEO Tuesday told reporters Tuesday that Kaplan’s ruling should bolster the case in those countries. The judgement, according to Deepak Gupta, who represented Donziger, amounted to “what is in effect a global anti-collection injunction that would preclude enforcement of a judgement from one country in every jurisdiction.” He noted that was one of the main reasons why the appeals court overturned Kaplan’s 2011 decision. Marco Simons, legal director of EarthRights International, told IPS Tuesday’s judgement was vulnerable on other grounds as well. He said the law over whether the kinds of injunctions issued by Kaplan could be employed under the federal racketeering law remains unsettled.